There may be no better symbol of the increase in worldwide knowledge of viticulture and winemaking than the surprisingly decent table wines being made on the island of Bali. Hatten Wines hasn't been making good wine long enough to build the reputation for quality that it deserves. When I told expats in Indonesia that I really enjoyed the white wine -- I brought two bottles home -- and found the rosé delightful as well, they snorted. "Those wines?" It's hard to overcome preconceptions. I don't know what Hatten was making five years ago, but they've figured out how to make good wine in a challenging climate. Hatten "Aga White" is made from Belgia grapes, which are not yet included in the massive reference tome "Wine Grapes"
that purports to include every commercially made wine grape in the world. As near as I can tell they are originally French table grapes, as are the Alphonse-Lavalée grapes from which Hatten makes both its red and rosé wines. Founded by a company that makes arrack, a hard liquor distilled (in this case) from rice, Hatten started off in 1994 by making a rosé, which makes sense because the style is more forgiving. However, if you want a taste of how winemaking is different near the equator, consider this: the company says that it has produced more than 300 vintages of rosé in 17 years. Jealous, winemakers? Imagine that: if you don't get the wine exactly the way you like it, you can have two more crops in the same year, from the same vines. No wonder the learning curve is steep. Table grapes are better suited for the climate in north Bali, which never, ever gets cold. There is a cooler area on Mt. Batur, but apparently that's used for coffee production; the grapes are grown near the sea. The good thing about growing grapes in a tropical climate is you don't get the same vineyard pests as France. The bad thing, as anyone who has vacationed in southeast Asia can tell you, is there's no shortage of other, previously unencountered insects. The grapes are grown in a pergola system, attached to small trees, which are regularly pruned. When harvested, they're taken to a modern winery with refrigeration systems, which makes all the difference in preserving these wines' freshness. The company started with the idea that resorts and cruise ships would buy a Balinese rosé wine. About a decade ago Hatten branched out into making white and red wines. The company's first efforts were all sweet wines -- it still makes a sweet white. Today the dry white is widely available in Ubud and seaside restaurants. After I tried it, it's all I wanted to drink. Granted, the alternatives aren't much, given Indonesia's punishing import taxes that turn Jacob's Creek's low-grade supermarket wines into luxury products. Bali has never been a place to drink wine, but Hatten is changing that. 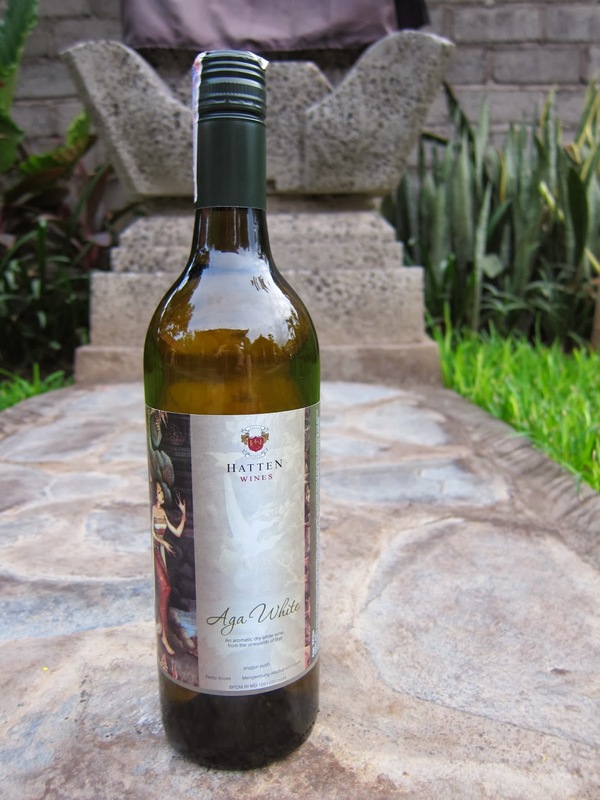 Hatten Aga White ($18) tastes tropical, with mango and passionfruit flavors, plenty of freshness and a restrained 11% alcohol that enables you to finish the bottle either before or after the traditional dance performance. It's delightful with grilled seafood, especially the overcooked style the Balinese flavor, and has the fruitiness to accompany the peanut sauce on gado gado. Serve well chilled. Hatten Rosé ($18) is a fruit-driven wine with notes of raspberry and a very light sweetness. It's often described locally as off-dry, but will only taste so to fans of bone-dry southern French rosés. This is no white Zinfandel; it's a well-balanced wine and that hint of sweetness makes it appropriate for the spicy sambals that accompany just about everything in Indonesia. Try it with duck roast in a banana leaf. Give new meaning to Bali High!